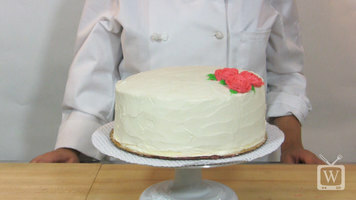 Use these simple steps to professionally add a buttercream rose. You'll need a spatula, rose tips, a leaf tip, couplers, a flower nail, a rubber spatula, and piping bags. Begin by squeezing cream onto the flower nail in a circular motion, creating a lump with a tip on it. To create the layers of a rose, squeeze cream in an short arch motion and continue rotating the rose until you have the desired amount of layers, or petals. Looking for just the right tools to decorate your cakes with? 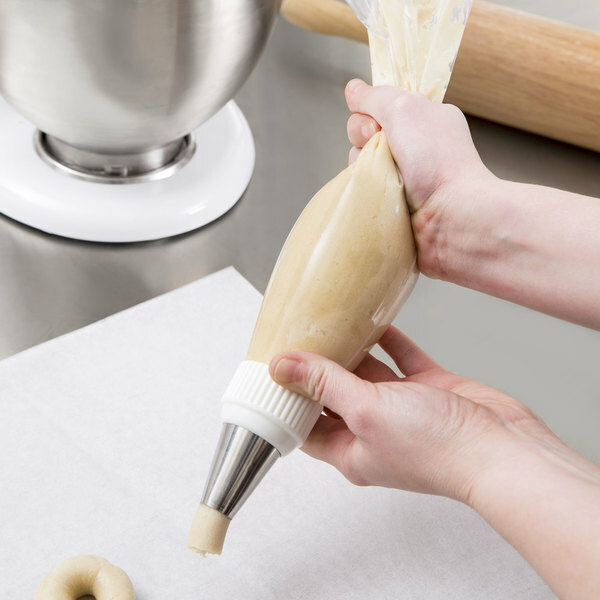 Try the Ateco piping bags, short spatulas, and pastry tubes! These tools will help you create weaves, ribbons, scalloped edges, and more that will leave customers impressed every time. Comfortably decorate cakes, cupcakes, and other confectionary delights with this Ateco 4675 18" soft heavy duty clear disposable pastry bag! Whether you're decorating at a commercial bakery or for a catered event, this Ateco bag is a convenient disposable option. Simply cut the end of the bag and insert the pastry tube of your choice to create basket weaves, roses, and other beautiful decorations. Thanks to its heat capacity, this bag is a great option for piping hot foods up to 200 degrees Fahrenheit such as mashed potatoes or melted chocolate for a clean presentation. Then when you're done, you can throw it away for easy clean-up. These bags come in a convenient box, providing easy storage and creating more workspace! Thanks to its flexible .0045" polyethylene material, this bag makes for efficient filling of both hot and cold foods, but it won't stretch or balloon when piping thick frosting through the small tube openings. Its easy-to-grip material will help you streamline your operation and create professional looking desserts. Plus, it's clear for easy product identification. 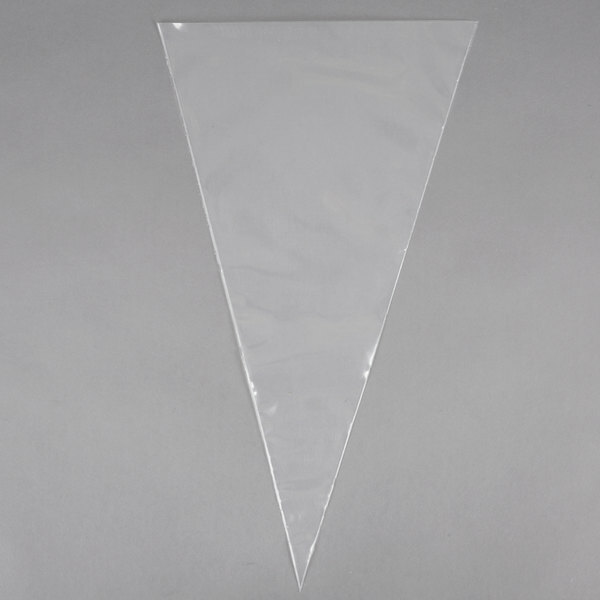 This soft bag is 50% thicker than other clear bags and can withstand a heavier amount of product- perfect for your busy establishment! Bringing you innovation and quality for over 100 years, Ateco, an August Thomsen brand, has been internationally known in the industry for creating baking tools of superior craftsmanship and design. By continually improving on tools, materials, and packaging, Ateco is dedicated to providing professional bakers with the kitchen essentials they need to succeed in an ever-evolving industry!! Having a startup cafe, we needed all equipment for our cafe and this one is just right. This worked as expected and it's just the perfect size for decorating out cupcakes. I never had any issue of the bags tearing etc. After our company had used reusable pastry bags I can say these are well worth the price! They can keep up with our tasks and make clean up so much easier! These bags are amazing. They are sturdy, large and if washed properly can be used over and over. The price is not able to be beat anywhere on the internet. Very happy. Have used these bags for years! 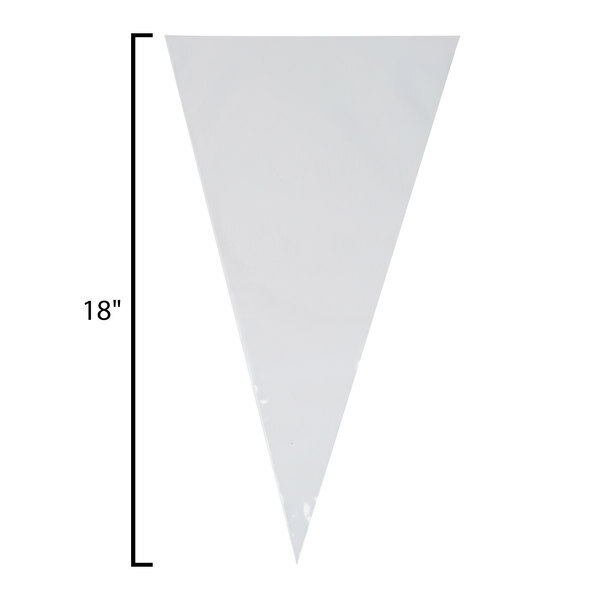 The 18" disposable pastry bag is awesome and is perfect for piping our fillings and frostings. We love using them to fill our cupcakes with lemon curd. Wow, I can not say enough about these piping bags. I use them to frost cakes, cupcakes, cookies, the list goes on and on. A must have for the baker that hates refiling piping bags. These work great, they are very sturdy. We use a "Foodsaver" to seal the bags and not all bags are thick enough so they don't melt when the heat seals it. These bags are great quality and can handle about 2 to 3 cups of buttercream or macaron batter etc. I like that the plastic is a bit thicker and sturdy while still being flexible. Our staff loves these bags. They can be packed full of product and never tear. Makes easy and convenient storage for items. Great for decorative piping. For those big jobs, you need a larger pastry bag. I use these for baked doughnut batters, cake batters, and custard fillings. It holds a lot more so you don't have to worry about it dripping out the other end. They also do well after being frozen as well as having warm custards put in. I always prefer disposable over the cloth bags, more sanitary. The disposables might be less cost-effective in the long run, but they're good in a pinch. They are meant to be disposed of, because the plastic doesn't clean out very well. I use these pastry bags constantly. You can pipe all sorts of pastries and creams easily with these bags. They are a sturdy plastic and is of a great quality. I actually have used this exact brand in culinary school and various pastry kitchens. Great product! These bags work great. There nice and long for when I am doing alot of decorating and very reasonably priced for the amount you can get. These piping bags work well when they are not sticky. We have a couple batches that were sticky, making difficult to pipe our icings. Since they are a must have for our bakery, we have never tried to have webstaurant replace them. We are forced to use them. I used to buy these from another supplier and they were so expensive. They are on a roll (convenient!) and much cheaper. We go through about 20 a day! These are great bags for cake decorating. I like to fill them with batter to make funnel cakes and churros. Great to use to fill squeeze bottles with too. I have looked for a long amount of time for a reasonably priced disposable decorating bag. I use this with a Wilton #789 tip to get the frosting on my cakes and was always a pain to wash out a pastry bag if I needed another color for a cake instead of the basic white. These can be rinsed and reused, but for the price I don't bother! LOVE THESE! These decorating bags are used on a daily basis in our bakery for buttercream and decorator icings. They are very sturdy and I have never had one break on me. I use these bags almost everything for my appetizer and canape. I have no problem with them busting open or breaking. the piping bag work out pretty well also can use as a funnel as well. great product for ateco. These patry bags are very easy to use and nice to control. The are re-usable and always serve a good purpose. They are also easy to clean. We love using these bags. They save so much time in labor compared to cleaning cloth piping bags. These never burst or explode, saving time and no need to worry about replacing bags. They are a little more than some of the 18" bags on a roll, but since they don't break, it's about even. This is all we use at our store! We use these bags for EVERYTHING! I have not had a problem with them busting open or breaking. These will work as a funnel as well! These arenty just great quality!! they are a great priced. We go through so many of these that it was nice to find just what we need and a lot less than we used to pay!! Love using these decorating bags! They allow for ease of use and precision decorating. Not to mention finding a price this good is rare, so snap them up while you can! 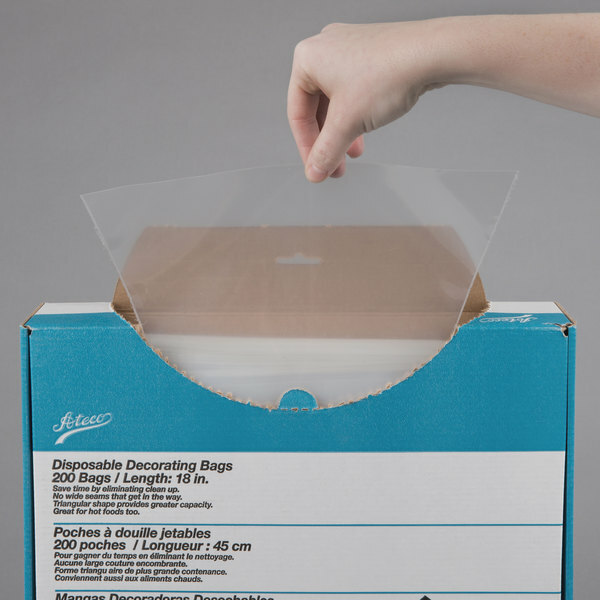 These Ateco disposable bags are just what we were looking for. The quantity and price are great, we would defintely order again! Super fast shipping too. Tried out these bags and am very glad I did. They are made of the highest quality. I just love them. I have purchased bags form other companies only to have them busted before I even put anything in them! These are great and will be the place I go when I need more bags! We'd be sunk without these. They're sturdy, have a good grip (takes a little getting used to), and a great price. We go through boxes and boxes of these every week...wouldn't choose another product!! These are your best friends when doing cakes and cupcakes. Every baker needs piping bags, and I hate the hassle of having to wash out and dry my reusable bags everytime I need to do something else. So instead, I use these disposable bags and just toss them out after I am done with them. And when I'm piping out thicker batters of thick fillings, I actually fill one of these disposable bags and place them in a cloth piping bag for extra strength. It makes cleaning the cloth bag so much easier, just take out the plastic bag and coupler and its good to go. This is the perfect size pastry bag! 12" doesnt hold enough and 24" is almost too big to handle. It's great! Fits the largest tips very well. 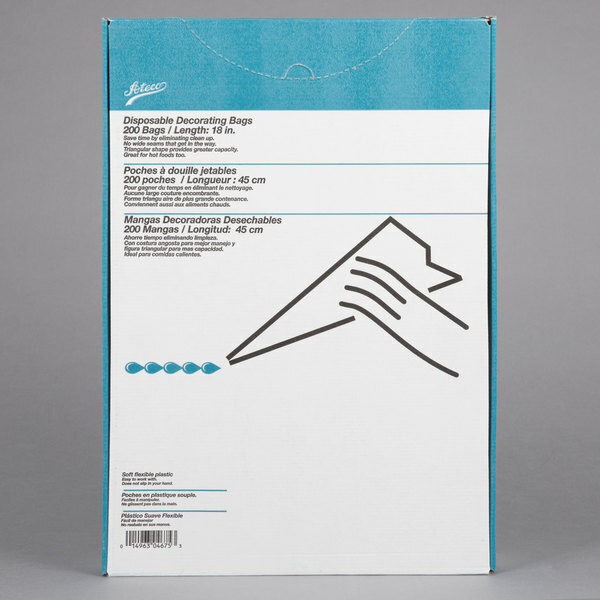 These largs pastry bags are essential to every bakeshop. Sometimes depending on what I use them for, I might wash them and reuse them. They are very durable. These bags are great because they are made of a high quality plastic and rarely tear or break. They hold a substantial amount of frosting which allows for less frequent refills and faster production times. Up until now I've been using a 12" disposable pastry bag. They work, but when I saw you carried an 18" I was sold. Easy to use, wide opening, perfect. An excellent bag for the money. I am teaching young teens cake decorating and this bag is wonderful. Big enough to hold a good amount of icing but not too big that they can not control it. I love these bags. They are big enough to ice cupcakes with and I can cut them down for smaller tasks, such as piping. They are thick and strong and don't get holes when piping thick icing. A practical and affordable way to decorate cakes, stuff chili peppers, etc. The product is of good quality and is fairly priced. I would recommend.